I searched for this topic expecting to find a bunch of opinions, especially among stick burners, but I only found a couple of hits. So I guess I'll get it started and see what happens. Do you want bark on your wood or not? Everyone loves bark on their meat, but what about on the wood you use to cook with. I have a Reverse Flow Stick Burner. Oak is the easiest wood to come by here in South Florida. I start with a few coals then add a stick or two of oak and toss in a small hickory stick for extra flavor as I'm going. Usually I try to knock off as much bark as I can from the wood, no matter what kind it is. I tend to think it will cause black smoke and soot to get on the meat, plus give it a burnt taste. Now maybe if i let all of it burn off before I put the meat on it would be ok, but when I'm just adding wood for fuel to keep the fire going, what happens then? If you leave the bark on do you put it on the fire bark side up or down (assuming you are using splits) ? Maybe if the fire is hot enough it won't matter because it will burn thru and be clean by the time the smoke hits the meat? WHat about pre heating the wood by sitting it on the firebox before putting it in? My brother in law seems to think the bark creates more and heavier smoke (which is a good thing in his book). I have heard a few theories before. In fact I heard of a guy using nothing but bark to burn, maybe he uses them like pellets or chips, not sure. All I know is that Im kind of afraid to roll the dice. I could just continue doing what I'm doing but if I can save a little time and energy by not having to worry about getting rid of some bark then it would be worth it. I'm always open to hearing about other peoples thoughts, opinions, and experiences. So, how do you burn, bark or not? Come on wit it. Re: How do you burn, with bark or not ? I'm curious too. In the limited amount of cooking I've done so far I left the bark on. I do preheat the wood by either putting it on, under or beside the firebox with the thought that it would be more efficient than putting it in cold and using energy to warm up the wood instead of keeping the cook chamber warm. My self I only use sticks after getting the fire going. I don't use any bark if I have a choice when getting things rolling. But once the smoker is hot all the way through. I tug on the bark if it won't come off it goes in the fire as is. If it comes off easy I take it off. I have a mindset that the bark is like an orange peel, the orange meat is great but the peel is concentrated. I don't have any proof but that is my thinking on it. I like the orange peel analogy. I do the same as you Rod. If the bark comes off easy, I take it off. Sometimes I even chop at it a little with a hatchet. But if its too much work, I just leave it. I remove it if it comes off easily but the stuff that's stuck goes in the FB. Good reason to burn fruit wood if you can get it. Paper thin bark. I don't use wood with the bark on. I've always heard it has a bitter taste. I take mine off while I'm splitting green wood. Since I use a gas splitter, after I split the wood, I run the blade between the wood and bark. Normally it pops right off without having to run the blade all the way down. Keeps insects from living between the wood and bark too. It's double the work, but that's what I do. What kind of wood are you splitting? The red oak in NJ does not split that way...it is also stringy in spots. Other times the wedge barely goes in two or three inches and the log pops into two pieces readily. Lol....my pellets come de barked!!! I'm kind of digging up an old post here, but hey it's at the top of the page. I supply a restaurant with both grill wood and smoking chips. They use hickory exclusively. On their grill wood they have no preference for bark on or debarked wood. The previous kitchen manager used the bark that fell off of the wood in their smoker. That changed with another km who wanted chips with the bark removed. I tell that story to say that even they don't have a unanimous opinion. I can say, having burnt tons of scrap bark piles, that bark burns quick and very hot. I should add that this is not a BBQ joint. They only use their smoker for fish. Another vote for Rodcrafter....I'd rather not burn bark but I'm not gonna spend a lot of effort to get rid of it. With that said, I personally think the first hour the meat is on is the most important so am more picky on the splits---I grab the naked ones first. For the record, I burn pecan....I'd say it's half as thick on avg as red oak. If a hickory tree is cut when the sap is rising, it will shed most of its bark when it dries. byersfarm wrote: If a hickory tree is cut when the sap is rising, it will shed most of its bark when it dries. I'll have to try that...real soon. I prefer to buy logs that are cut in the summer or fall just to avoid the mess that 100 ton of logs can make. I'll have to try the sap rising trick. I have had problems with bark holding in moisture in powder post beetle tunnels that are unavoidable in my area. Having said that I don't usually worry about the bark much unless I'm having major issues, once the pit is warmed up and a solid bed of coals is in place I can burn about anything reasonably. I hope it doesn't make a liar out of me now that I said something. We have some beetles down here and I can see what you mean about the moisture. I've got about 40 acres of woods behind my house with a substantial population of hickory. Something is killing then in our area so I don't expect they'll be healthy for too much longer. I had a logger look at it a couple years ago and he said I had the healthiest stand he had seen for quite a while with only about 15-20% affected. I hope to get out there as soon as the muddy season passes and get a years worth pulled out. Some of the oak logs I cut are too big and heavy for me to load into the truck or trailer and they wind up sitting a year or more. When I finally gather them and get them to the log splitter, the bark will strip of more easily but like Mike, the tunnels and powder from beetles can be substantial. Since we are all just offering our opinions from our experiences... I agree if the bark is falling off don't use it. My burn out was with some old wood. My sinuses were jacked up for 3-4 weeks after that day. I had sore throat and all started that night. I do jot believe I have ever used that old of wood. It may have burned fine a split a time but I don't care to risk a cook over it. 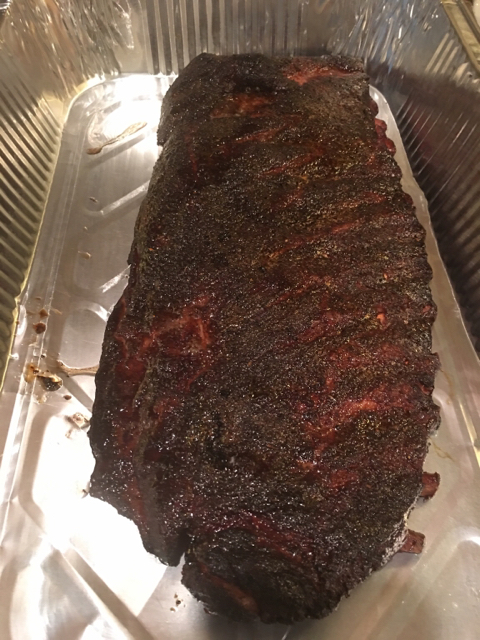 I cooked some ribs a few weeks ago to compare wrapped vs non wrapped results. During The last hour or so of the cook I tossed in a piece of oak with a lot of bark on one side. I noticed that the unwrapped ribs were almost black in color compared to the others. I have done this before but usually I try to remove the bark if it comes off easily. 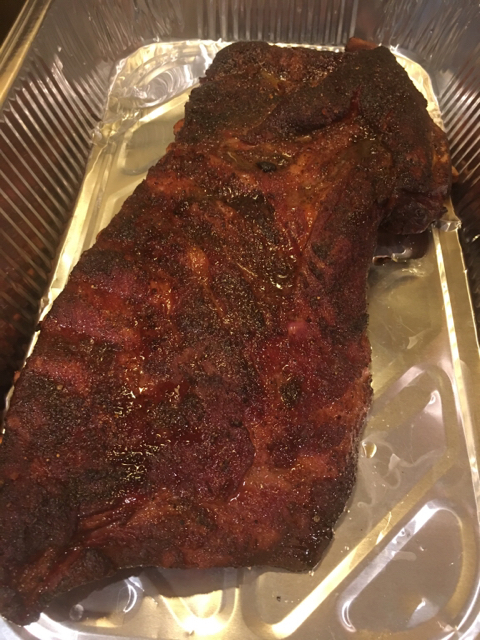 I think the bark produced a heavier, darker smoke that caused the meat to turn black. I wasn't surprised that it was darker, just not that much.